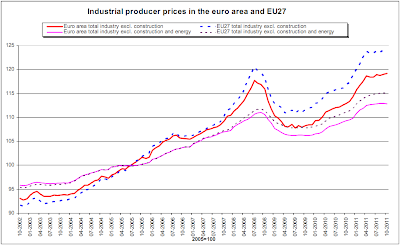 Eurostat released the October data point for their industrial producer price index (PPI: an index that tries to track average prices paid for all inputs by European industrial concerns - excluding construction). 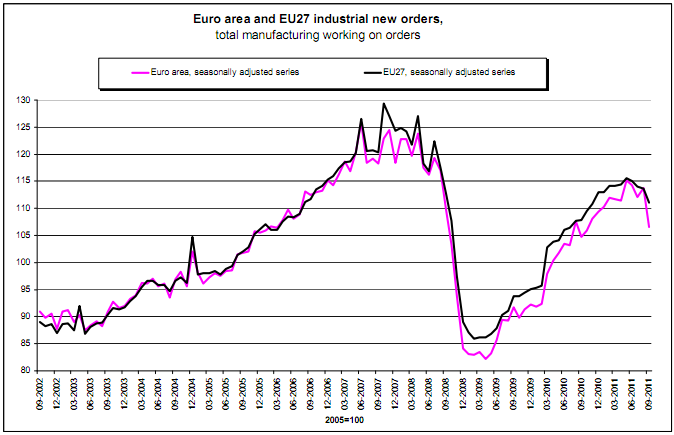 As you can see it has been rising, but more slowly during the period this year that European unemployment is rising and retail trade contracting. 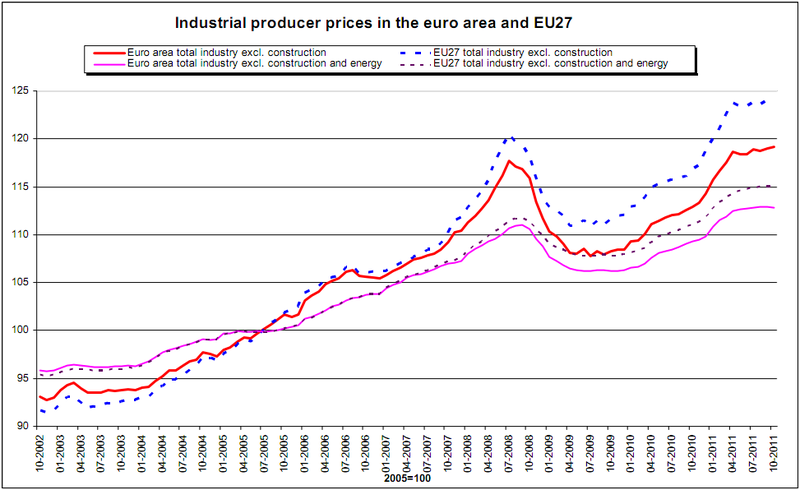 The index excluding energy contracted very slightly in October. Whether things will play out the same this time is less clear - in particular oil prices have been broadly declining in the second half of 2011 rather than rising as they were through 2007 and the first half of 2008. However, in general it makes sense that when final demand is disrupted (eg due to a credit crunch) that would show up first in orders for finished goods. Only after orders for goods currently in manufacture are fulfilled would it translate into prices for intermediate goods and eventually raw materials. 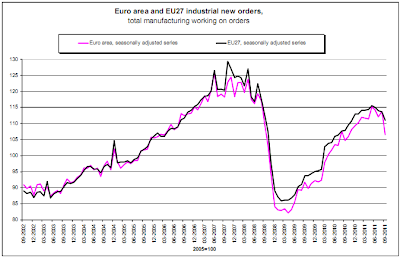 That is clearly a process that could take a number of months, so perhaps it's reasonable that PPI is not falling yet, given that industrial orders have just begun to fall (and we don't know at this stage how far the latter will fall). On the third hand, futures markets will of course do their best to anticipate what demand for producer inputs will be and will translate that into spot prices. The fact that this is not happening more strongly in the PPI is evidence that most futures market participants are not yet convinced that a significant slowdown is inevitable (just as they similarly weren't convinced in early 2008). So many different forms of economic stimulus these days it seems. Six central banks (US Fed, European Central Bank and the central banks of Canada, Switzerland, Japan and the U.K.) started a new program to provide cheaper dollar funding for starved European banks. It doesn't even have a nickname, I just see "Central Banks Dollar Swaps". Under the program, the Fed lends dollars to the other central banks in exchange for currencies including euros. The central banks then lend dollars to commercial banks in their jurisdictions through an auction process. These days the price of commodities like crude oil only rises when economic stimulus is deployed. The world's economy would be in free fall if it wasn't for an endless variety of stimulus gimmicks. If QE3 was deployed the US would see $4 and even $5 gasoline in a couple months.